The Boston Athletic Association will paint the first mile of the Boston Marathon in Hopkinton with a three-striped blue line this week, the same line painted on the final stretch of the race through downtown Boston, to ensure the opening mile is tracked accurately. Meg Reilly, the BAA’s director of communications, wrote in an email the blue line in Hopkinton will be based on measurements taken by town and race officials. 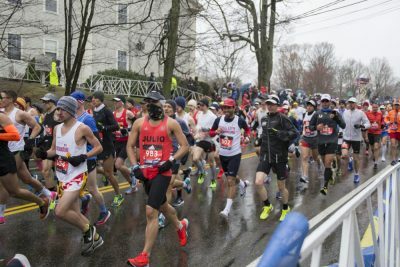 “The Hopkinton Blue Line is similar to the Boston Blue Line: marking the official measurements taken by town and race experts to ensure the first and last mile of the Boston Marathon are accurately tracked,” Reilly wrote. Hopkinton selectman John Coutinho said the lines also represent Hopkinton’s involvement in the marathon, Reilly wrote in her email. In 2016, the Boston Police Department first added three blue lines to the final stretch of the marathon route spanning from the final turn onto Boylston Street to the finish line, according to a Boston.com article. In the law enforcement community, the blue line is symbolic of how police officers separate good from evil in society, the article stated.